Samsung has officially launched the all-new Galaxy S8 and S8+ in India for Rs 57,900 and Rs 64,900 respectively. The smartphones were officially announced internationally on March 29 at a launch event in New York. The new flagship devices are pretty impressive from their first look, carrying nearly bezel-less display and impressive technical specs. The new 5.8” and 6.2” screens are called infinity displays while their resolution can be selected between full HD+ and Quad HD+, as per the needs of the user. The end to end display and its rear glass is protected with Corning Gorilla Glass 5, eliminating the need of using protective gear for keeping the scratches away from your phone. Samsung has even left the home button behind for the new flagship series. The haptic feedback helps the user locate the virtual home button by pressing hard on a specific spot on the screen. Other important feature includes an iris scanner, heart rate monitor and fingerprint sensor on the duo. 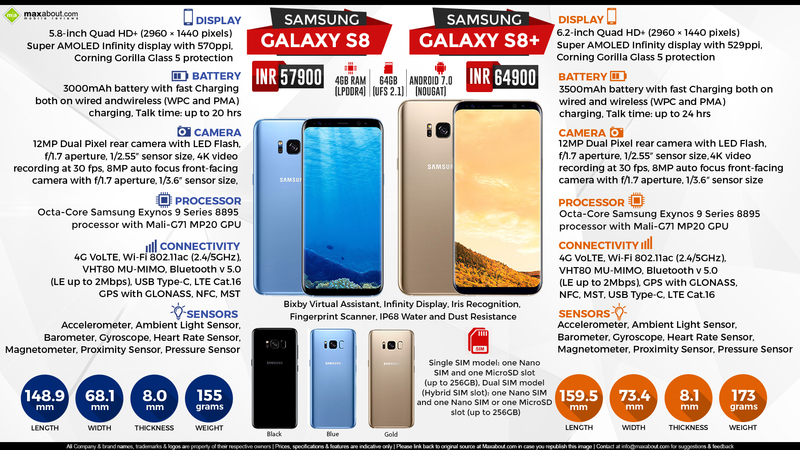 Samsung S8 and S8+ are offered in five attractive shades internationally while the Indian market gets three shades: Midnight Black and Maple Gold for S8, while the S8+ also comes in Coral Blue. Newly introduced feature on the duo also includes Bixby, the new virtual assistant on the flagship phones. The international version of S8 and S8+ is powered by Octa Core Snapdragon 835 processor with Adreno 540 GPU while the Indian version uses Exynos 9 series 8895 processor with Mali-G71 MP20 GPU. The RAM stays 4GB while internal memory on offer is 64 GB. It can be expanded through microSD card slot. Both the phones use Super AMOLED displays and runs Android 7.0 Nougat out of the box. Galaxy S8 uses a 3000 mAh battery while S8+ comes equipped with 3500 mAh of battery power. Click here to know more about Samsung Galaxy S8 Plus.